The Essence Express Dry Drops claim to dry nail polish in just seconds... whilst I don't believe this claim I am so impressed by this product! This product dries the nails in minutes and protects against chipping. I have used OPI Drip Dry drops in the past and loved that product but I never repurchased due to the cost. At $23.95 AUD I turned to cheaper alternatives such as the Sally Hansen Insta-Dry Top Coat but I have never enjoyed that product quite as much. 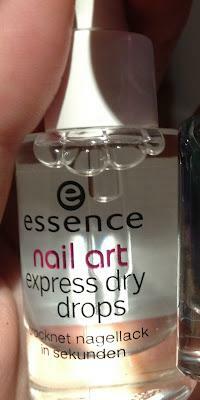 You can find Essence at Target nationally and it retails for $3.95 AUD! This is such a fantastic product for the price I will be re-purchasing this over the OPI in the future.